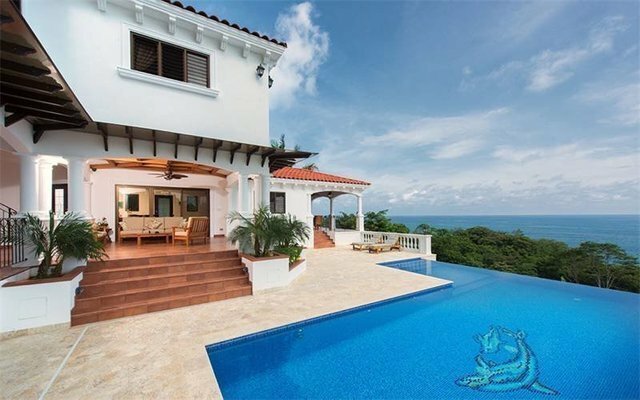 Villa Amore is a beautiful Tuscan style villa with breathtaking views of the Pacific Ocean.Villa Amore consists of 4 bedrooms, 4 full bathrooms and two 1/2 bathrooms. Three of the rooms have queen size beds while the master bedroom accomodates a king size, all four bedrooms have their own en suite bathrooms and walk in closets for convenience. Additionally there's a care taker's head quarters which consists of a fully furnished bedroom and bathroom.A custom designed, fully equipped and spacious chef's kitchen serves to entertain large or small crowds. Next to the kitchen, an over-sized outdoor terrace, with BBQ grill and table with chairs to complete the natural beauty that surrounds the entire villa with direct ocean view and surrounded by lush tropical garden.Villa Amore is only a 5 minutes drive from beautiful Playa Carillo. In March 2013, Travel and Leisure Magazine featured it in the Top 25 secret beaches in the World. It is described as white-sand beach is framed by mountains and just off a palm-lined boulevard. It is known among divers for its excellent coral reef teeming with marine life, the beach is protected by rocky headlands, providing calm, warm water for swimmers.